Our current foster dogs are shown below. See their stories under “Our Westies: Photo Album” to learn more about them. You can apply by using the application on this site or you can talk to someone in more deail by contacting Jean Story at 517-267-8838. We seldom place outside of the state. Occasionally a harder to place dog may find a home in a neighboring state but due to the difficulties in enforcing contracts, doing home visits, getting the dog transported back to us if the adoption doesn’t work out, etc., it is rare that a dog would go to a distant state. If you have it in your heart to foster a Westie, please go to the link above called “Volunteering”. We hate to have to say “no” to any Westie in need but we don’t have the foster space to continue taking them in at this rate. While we may not seem to have a lot of dogs when you look above, at times we have had as many as ten. They tend to come in groups and it puts a real strain on our resources. If you can foster even once or twice a year, it would be a huge help and may even save lives. Please give it serious consideration! A Westie NEEDS YOU! CLICK ON SANTA PUPPY ABOVE FOR “YE OLDE PUPPY SHOPPE”. PLEASE READ BEFORE YOU SHOP!!!! Lansing — The Michigan Senate has unanimously approved legislation to ban the use of poisonous gas to euthanize unwanted dogs and cats at animal shelters. The plan requires the use of lethal injections at animal shelters when unwanted dogs and cats are killed. Supporters say the injection method is more humane. Republican Sen. Rick Jones of Grand Ledge, who is sponsoring the bill, says four county shelters in southwestern Michigan still use a gas chamber. They are Branch, Berrien, Cass and Van Buren counties. The legislation approved Thursday now heads to the House. The Senate passed it on a 37-0 vote. Similar bills have stalled in the past, but Jones says he has addressed concerns from farmers and veterinarians who worried the legislation could set a slippery precedent. OUR NEW LOOK IS MORE THAN SKIN DEEP!!! August 15, 2012 was an important date for us! On that date, Westie Rescue Michigan obtained official status as a Michigan Non Profit Corporation! On October 5, 2012 we finally jumped the last of the insurance hurdles and are now able to announce our existence as a rescue organization independent of the Local Club. This will not change our focus. We will still maintain an “affiliation” with the Westie Club, do the Rescue function for the Club and maintain a close relationship. We have also filed with the IRS for a 501c3 tax status. Once approved, this will allow us to become tax exempt and to offer tax deductions to those who donate to us. We have been waiting a long time for IRS approval but understand they are understaffed and way behind on processing these applications. We are waiting for our turn but it could still be a long wait. You will notice our new logo (above). Our little Westie is being protected by the Westie Rescue Michigan umbrella as we hope to continue to protect the many little Westies who need our help. The logo was designed by volunteer, Marcia Reimer. We expect to also use our old logo on certain items but most logo’d items will use the new one. It has happened yet again. An owner, who never conceived that she might need to surrender her dog to rescue, called because her life did not go as planned and she needs to find a place for her dog. She doesn’t want to put the dog to sleep and is hoping we will take the little girl into foster care. We started looking for foster homes at this, the start of the holiday season, when foster homes are hard to come by. We had a volunteer right away…..until she found out the dog isn’t crate trained. She works and needs to crate the dog while she is out of the house. So the foster home fell through. Life happens, folks! You don’t know when something might happen and you can’t keep your dog. You don’t know when the dog might get sick and need to spend time in the hospital where he or she will be crated. In either situation, the dog is going to experience extra stress over the separation by being forced into a crating situation. If the dog knows how to be crated and has learned to like their crate, life would be so much easier (for you, for the dog, for everyone)! Think ahead and make life easier on your dog. It is such a simple thing and it could make the difference between life and death. If your current dogs don’t welcome a crate, start training them now. If you get a puppy, crate train from the beginning and keep up the training. Give your dog as much flexibility as you can so they will better survive whatever life throws at them. Westie Rescue Michigan is a State of Michigan non-profit organization. We are currently applying for 501c3 Federal Tax Status . Our primary goal is to be the safety net for all homeless Michigan Westies who do not have a responsible breeder who will stand behind them in their time of need. 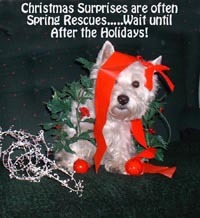 We continue to function as the Rescue arm of the West Highland White Terrier Club of Southeastern Michigan. We accomplish this goal by caring for those in need through our foster-care system, supplying medical, emotional and behavioral care for these animals and eventually finding permanent homes for those who are safely adoptable and euthanizing those determined to be unsafe or too sick to have a good quality of life. We spay/neuter all animals who come through our program, prior to adoption unless medically counter indicated. We advocate abolishing pound seizure and are against animal cruelty. Westie Rescue Michigan supports humane education programs for the public and encourages respect and compassion for all animals. We raise funds to support our efforts and, on occasion, to support similar efforts of other groups. We may also use these funds to support medical research meant to benefit the breed.